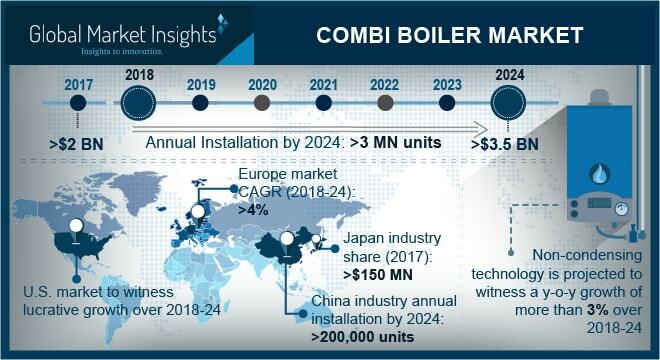 Combi Boiler Market size will exceed USD 3.5 Billion by 2024, as reported in the latest study by Global Market Insights, Inc.
Investments toward retrofitting of existing residential infrastructure coupled with rising demand for effective water and space heating will stimulate the combi boiler market growth. Ongoing replacement of traditional heating units with an aim to minimize the carbon footprint will further complement the industry landscape. Regulatory bodies across the globe have undertaken policy measures to encourage the adoption of efficient heating systems. Energy Efficiency Directive, Energy labelling & Eco-design directive and Energy Performance of Building Directive (EPBD) are some of the key measures adopted by the European Union to limit greenhouse gas emissions. China combi boiler market is set to exceed an annual installation of over 200 thousand units by 2024. Rapid urbanization along with rising disposable income across the nation, positively impact the business dynamics. As per the United Nations, the percentage of urban residents across China is set to exceed 75% of the total population by 2050. Ongoing investments toward expansion and upgradation of residential infrastructure will further boost the product demand. Rapid urbanization on account of robust growth across developing economies along with harsh winter conditions across Europe, North America and Pacific region will augment the combi boiler market. These systems offer improved fuel saving and provide added benefit of space and cost reduction when compared with traditional heating systems which in turn boost the product demand. Germany in 2017, accounted for over 10% of the Europe combi boiler market share. Government initiatives to promote sustainable technologies coupled with growing construction sector will drive the product installation. Germany in recent years, has witnessed rising investment toward residential buildings which has positively embarked the industry growth. For instance, number of new residential buildings in the country exceeded 230 thousand in 2014 witnessing growth over 26% when compared to 2011 levels. Gas-fired combi boiler market is set to witness strong growth on account of competitive gas prices, low cost, and ease of fuel storage. Ongoing efforts to optimize the residential sector energy consumption coupled with stringent emission norms will further fuel the industry growth. Adequate gas supply networks along with crude oil price volatility make installation of these units preferable over its alternatives. France combi boiler market revenue is set to surpass USD 200 million by 2024. Retrofitting of existing buildings along with policy initiatives to limit carbon footprint will stimulate the replacement of traditional heating units. In 2015, the government introduced “Energy Transition for Green Growth” law which aims to limit the final energy consumption across various sectors of the economy. Compliance with the stringent efficiency standards coupled with competitive pricing are some of the key underlying factors which will boost the condensing combi boiler market growth. These systems find significant penetration across EU where policy initiatives have significantly boosted the product adoption. Growing consumer awareness towards integrated water and space heating systems will further complement the business outlook. Key industry participants in the combi boiler market include Daikin, Hoval, BDR Thermea Group, HTP, Wolf, Ferroli, Viessmann, Fondital, Vaillant Group, ACV, A. O. Smith Corporation, SIME, Ariston Thermo Group, KyungDong Navien, Bosch Thermotechnology and Groupe Atlantic.